Definition Wikipedia: Start with any positive integer n. Then each term is obtained from the previous term as follows: if the previous term is even, the next term is one half the previous term. If the previous term is odd, the next term is 3 times the previous term plus 1. The conjecture is that no matter what value of n, the sequence will always reach 1. 13 → 40 → 20 → 10 → 5 → 16 → 8 → 4 → 2 → 1. The Task: The task in ProjectEuler is to searching for a the Number N, under one million, that produces the longest chain. 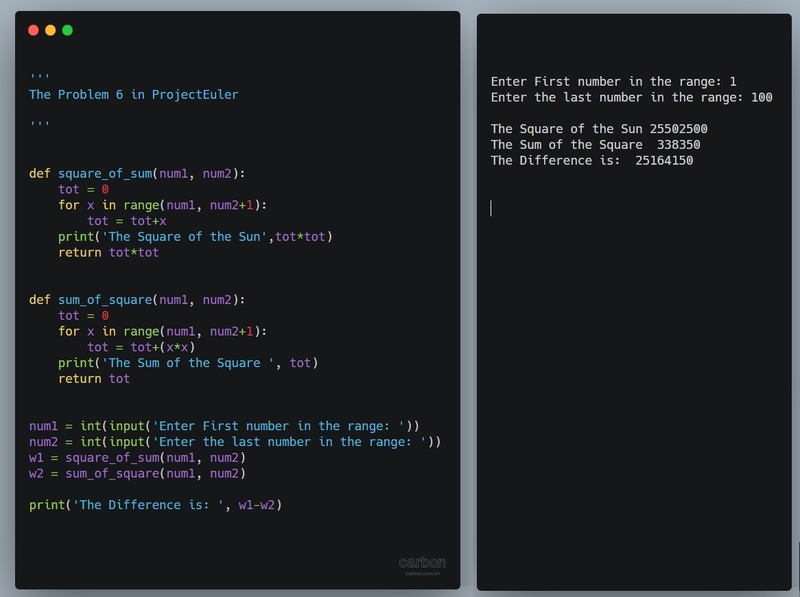 The Answer: In my previous codes or math solving challenges in pybites or ProjectEuler I am solving the problems, writing the code, but not posting my answer to ProjectEuler platform. Today, and with Problem No.14 i decide to post the answer in the ProjectEuler platform for the first time just to see what will happen. The answer was 837799, and I get this page. In the code bellow, i set the range from 1 to 50000. This is a short task to get the factors of a given number. The Definition of Factors of N is: The pairs of numbers you multiply to get the N number. 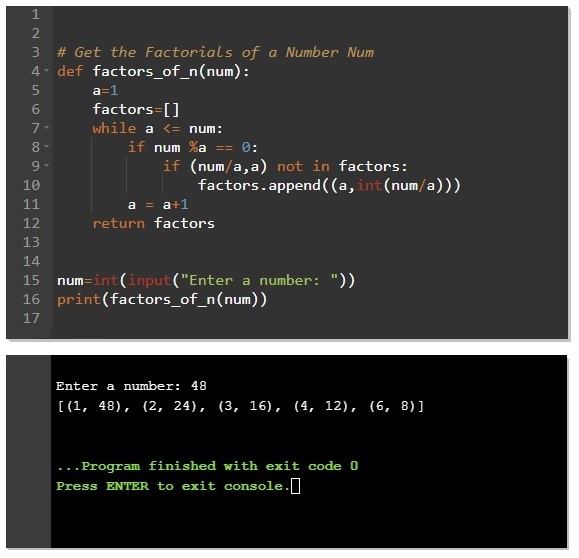 In this task we will write a Python code to ask the user for a number N then will get all the pairs number that if we multiply them will get that N number, we will store the pairs in a array ‘factors’. In this task we need to calculate the SUM of all divisors of N, from 1 to N.
Then we calculate the Sum of (sum of N divisors ) let’s say M .
For example, the proper divisors of A=220 are 1, 2, 4, 5, 10, 11, 20, 22, 44, 55 and 110; therefore F(220) = 284. And the proper divisors of B=284 are 1, 2, 4, 71 and 142; so F(284) = 220. So F(A) =B and F(B)=A then A and B are amicable. If f(a) = b and f(b) = a, where a ≠ b, then a and b are an amicable pair and each of a and b are called amicable numbers. In this task we will ask the user to enter a Range of numbers and we will search for all Amicable Numbers pairs in that range(from – to) if we fond one we will print out the number and the divisors list. The main function here is the one that get the sum of divisors, we will call it get_divisors_sum and we will examine Amicable with If statement. In Problem No.16, projectEuler ask to find the Sum of power of digits in the number, for example if we have 2^15 (2 to power of 15) the answer is 23768 then we need to calculate the sum of this number (2+3+7+6+8 ) that’s equal to 26. The Task: So our task in this project is to find the sum of the digits of (2^1000). To write this as a program and to make it more general we will ask the user to input the number and the power he want, then I start thinking to restrict user from input large numbers that could cause CPU problems, but then i decide to keep it open as is. Our task here is simple as the title, we will have a range and will test each number to see if it is a prime then we will add it to a list, once we finish we will print out the list. To complete this task we will use one of our function we create last time (Read: is prime post). So, here we will ask the user to input two numbers num1 and num2 the we will pass all the numbers in the range to is_prime() and store the result in a list. 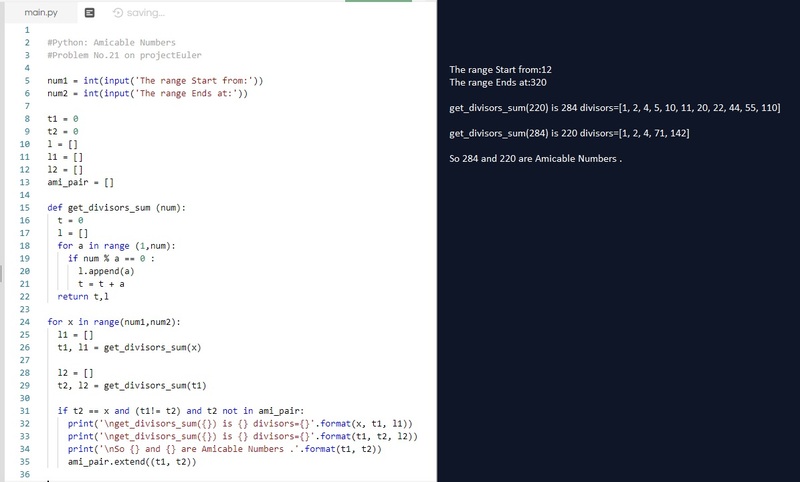 #Function to get all Prime numbers in a range. I fond this on projecteuler.net Usually I add some steps to there problems to make it more application look and feel. Later on, we’ll see how. Problem assumption: If we said that we have a range of numbers (1,10) then the sum of this range is 1 + 2 + 3 + 4 + 5 + 6 + 7 + 8 + 9 + 10 = 55, Now the Square of the sum is 55^2; thats mean the Square of the sum of (55) = 3025. Hence the difference between the sum of the squares of the first ten natural numbers and the square of the sum is 3025 − 385 = 2640. The Task:Find the difference between the sum of the squares of the first one hundred natural numbers and the square of the sum. Inhancment Now to make this task workking as application and to get more general output of it, first we will ask the user to input a range of the numbers, then we will applay the function on that range. # Problem 6 in ProjectEuler. #Ask the user for his input. In a simple way, a Prime number is a number that cannot be made by multiplying other numbers. So 4 is Not Prime because we can say that 4 = 2 x 2, 6 is Not Prime because it can be produced by multiplying 3 x 2; but 5 Is Prime because we can’t find any integer numbers that can produce 5. Numbers such as 1, 3, 5, 7, 11, 13 … all are Prime Numbers. This function will ask the user to write a number then we will examine it to see whether it is a prime or not.